It first debuted back in 2007, and now the 2017 Jeep Patriot in Colorado Springs, CO is in its 10th year for this generation. Perseverance is an admirable quality, especially in a rugged, adventurous vehicle like the Patriot. Jeep did a nice job enhancing the Patriot throughout this generation. The performance has stayed up-to-date, and the Patriot features a decent amount of off-road capability for its class, thanks to the Freedom Drive II package. It also has some pretty cool technology features and optional packages available to prospective drivers. On top of that, safety scores are good, making the Patriot a solid vehicle to drive. If you want to get one, act fast. 2017 will be the last production year of the Jeep Patriot. Why? Who knows? All we do know is that it’s being replaced by the 2nd generation Jeep Compass. First and foremost, it’s important to note that a Patriot with a Freedom Drive I package and the six-speed automatic transmission is able to attain 0-60 mph in just 9.4 seconds. That figure is better than a Honda HR-V (9.7 seconds), and comparable to Jeep’s own Renegade model. As many of you know the HR-V and Renegade do quite well in this segment, but the Patriot is keeping pace and keeping up with the competition. The Patriot has two engines. The base engine features a 2.0-liter four-cylinder, and the upper-trim engine is a 2.4-liter four-cylinder engine. This engine can only be paired to FWD. That 2.0-liter engine produces 158 horsepower/141 lb.-ft. of torque, while the 2.4-liter engine puts out 172 horsepower/165 lb.-ft. of torque. It can be paired to either FWD or AWD if either the Freedom Drive I or Freedom Drive II package is equipped. On both engines, a five-speed manual is the default transmission. On the 2.0-liter equipped Patriot, a continuously variable transmission (CVT) is the optional transmission choice; whereas, the 2.4-liter Patriot is offered with a conventional six-speed automatic. Unless the 2.4-liter engine is paired with the Freedom Drive II off-road package, in which case you’ll see a unique CVT on board that features low-range gearing. Lots of different configurations, but it’s important to know that a five-speed manual is the standard transmission, and the automatic (or CVT) is optional. So if you don’t enjoy driving a stick, make sure to grab the optional CVT or conventional six-speed automatic. When compared to the competitors in this segment, some say that fuel economy is a sore spot for the Patriot. Even so, it’s still able to provide decent fuel-efficiency. Plus, not all other models are able to offer the same type of off-road capability alongside fuel-efficiency as the Patriot. Nor are they able to offer all the fun technology features. For those looking for something capable and fun, the fuel-efficiency on the Patriot is more than enough. Of course, fuel economy varies depending on the powertrain and drivetrain setup. On the 2.0-liter engine with the CVT transmission equipped, you’ll get 22 mpg city/26 mpg highway (24 mpg combined). If you opt for the larger 2.4-liter engine with FWD and the conventional six-speed automatic transmission, it becomes 23 mpg combined. When Freedom Drive II’s unique CVT is paired to the 2.4-liter engine, fuel-efficiency drops down to 21 mpg combined. In the off-road environment, the Jeep Patriot proudly sports its Trail Rated badge, signifying its ability to conquer any off-road environment when the Freedom Drive II Off-Road Group is equipped. Apart from the unique CVT, this off-road group also includes a Freedom Drive II 4×4 system, tow hooks, skid plates, and anything else you’d need for the woodland trails. The 4×4 system in particular adds Off-Road mode with Hill Descent Control, grade-sensing features, and increases the crawl ratio for slower crawling over rocks and other rugged terrain. Sure, the Patriot is loaded with basic technology features across its various trims, such as a CD player, satellite radio, USB port, auxiliary audio jack, steering wheel with integrated audio controls, heated front seats, air-conditioning, and 6.5-inch touchscreen infotainment system (optional for the Latitude) paired with a navigation system, as well as a rearview camera. But more importantly, the 2017 Patriot can also be equipped with various packages. Two that stand out the most are the Sun and Sound Group, and the Power Value Group. Both of these packages add even more technology features that are meant to entertain and make life easier on the road. The Sun and Sound Group adds some fun technology features. Like a power sunroof, with an express open and close feature if it starts raining. It also includes a sunshade to help keep you cool. This package also comes with an upgraded audio system, which is way better than the standard four-speaker audio system the Patriot comes with. It’s a nine-speaker Boston Acoustics Premium Audio System with a subwoofer, delivering high-quality sound, and is very affordable because it’s bundled with the other two features in the Sun and Sound group. The third feature being rear liftgate speakers, which flip-down from above after you open the rear hatch. This way, you can turn your camping or tailgating trip into a real party. The Power Value Group adds plenty of convenience, like power windows with a driver one-touch feature to save a few seconds closing your window. Speed-sensitive power door locks are also found in this package, and will automatically lock at speeds of 15 mph or higher, then unlock when you turn the Patriot off and remove the key. Finally, heated power foldaway mirrors will help you on cold and icy days. The fold-in aspect is nice if you end up parking on a busy side street, or cramped parking lot. Standard safety features include antilock disc brakes and rear drums, unless the Patriot is equipped with the Freedom Drive I or II package. In which case disc brakes will be put in the front and back. Traction and stability control are standard, along with front side airbags and full-length side curtain airbags. On top of that, hill descent control is equipped courtesy of the Freedom Drive II Off-Road Group. This helps, not only when off-roading, but also if you have to drive down a steep and icy hill. Altogether, the Patriot has more than 30 available safety and security features, actually quite a lot for such a compact, yet capable vehicle. For safety scores, the Patriot earned four out of a possible best five stars for overall crash protection in NHTSA testing. In IIHS crash safety tests, the Patriot received the highest rating of Good in the moderate-overlap front-impact, side-impact, roof strength, and head restraint tests. The 2017 Patriot is proof that a vehicle doesn’t need to be big or burly in order to be safe. Typically, large SUVs, trucks, minivans, and sedans are what consumers choose if they’re looking for a safe vehicle. 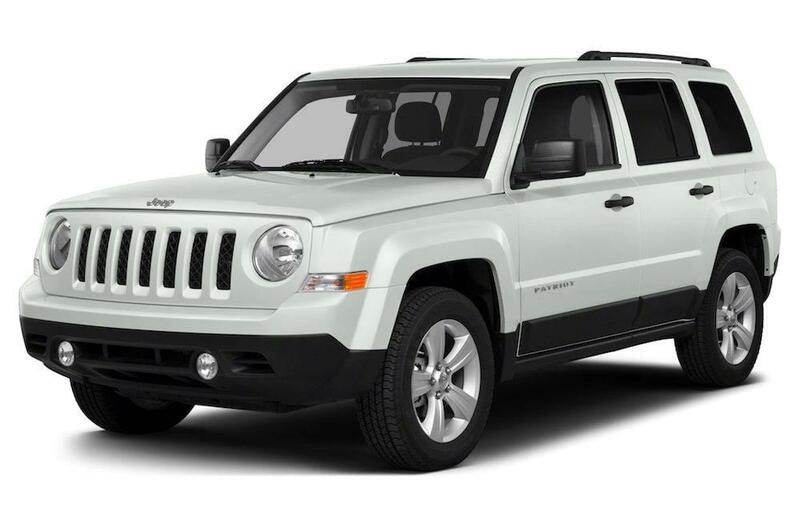 However, since the 2017 Jeep Patriot went through the same crash safety tests and was scored fairly, it’s clear that the Patriot is a safe alternative if you don’t want a large SUV, but are still looking for some of the utility associated with that segment. At Faricy Boys, we’re different from other dealerships and proud of it. Our main goal is to make sure you have an honest and comfortable car buying experience. Our genuinely caring sales staff will make sure of that, and our finance team works with a network of lenders to ensure that if you do find a vehicle you like — like the 2017 Jeep Patriot — you’ll be able to get the financing for it. Everyone on our team, from the service department to the sales staff, are real people with a shared focus: to change your opinion of car buying. A good start to breaking the dishonest and archaic stigma associated with car dealerships begins with our real prices and no hidden charges, and since we have been family-owned for over 73 years, you can expect to be treated like one of our own from the moment you walk through the door.